It seems like the suits in the TV industry are latching on to the fact that the geek quotient per capita has been on the rise and it makes good business sense to capitalize on that. 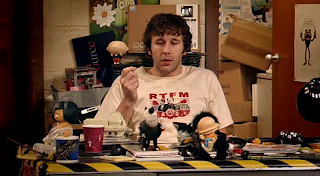 Case in point — The Big Bang Theory and The IT crowd. On the surface it would appear like neither of these shows have anything in common, but if you are a geek or if you’ve ever known one personally, you’d see why these sitcoms would appeal to the geeks. The first one — The Big Bang Theory, is about two physicists (one theoretical and the other experimental) sharing an apartment, which is across the hall from where a cute (stereotypical) blonde lives. The humour revolves around the social maladjustment of these geeks and awkward interactions between them (and their extended friend circle) and the blonde girl next door. What distinguishes this sitcom from the others is the accurate portrayal of geek subculture (discussions about QED, string theory, MMORPG, Comics and general lifehacks). Each of the geeky characters in the show, right from the PITA pedant, sheldon to annoyingly smart geekgurl leslie are very well defined. This series is /good entertainment/ for geeks. I don’t know of any other comedy shows that revolved around people of science and were also accurate in culture portrayal. (I’m serious ! I mean, besides Futurama which doesn’t count, since it is an animated sitcom set in the future, and everybody knows the future belongs to the geeks, anyways. So, if you know of any geek comedy sitcoms besides Futurama, please post in the comments). 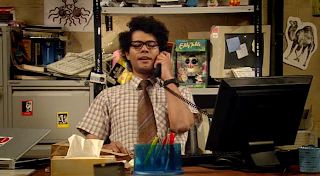 The second one — The IT crowd, is about the IT support department in a non-IT firm. I’m sure all the geeks out there are already shuddering at the thought of it 🙂 ! Well, this too has a funny and somewhat accurate description of geek subculture. However, what really gives me a chuckle or rather a warm fuzzy is the various geek backdrops that they have. For instance …the CC licensed Mao-RTFM t-shirt or the various eff.org stickers — Fair Use is has a Posse, MP3 is not a crime …or the perl camel or cthulhu forbid …the FSM ! It’s good to see that the geek memes are now creeping into pop-culture. I hope this trend of appeasing the geeks continues because everybody knows, eventually the geek shall inherit the earth and then ALL YOUR TV ARE BELONG TO US.